This is an air-polishing unit that is also great for stain removal. I find it particularly useful with patients who have braces or sensitive teeth. It’s also good for periodontal and implant maintenance. The specially designed nozzle has three outlets—one for air, one for powder and one for water. This greatly assists in reducing the incidence of clogging. It’s safe to use on implants and root surfaces, and a good adjunct at treating periodontal and peri-implant disease. It’s a fast, easy and painless way to clean around braces. The powder is a good solution for cleaning biofilm from around orthodontic appliances without the need to remove wires, ligatures or elastics. 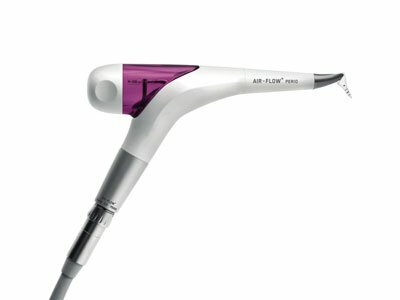 It cleans implant restoration surfaces without damaging the implant or the metal/ceramic surface. It’s surprisingly clean to use without the mess that usually occurs with traditional powder and pastes. Patients love it, especially those who are anxious about dental procedures. They love the fact that it can do its job with minimal digging with sharp instruments. It’s often marketed as a ‘dental spa experience’ and is compared to having your teeth gently exfoliated with a fine emollient powder that tastes sweet. It needs to be used with the help of an experienced dental assistant with good suction skills. Generally, my assistants have found it to be a little more demanding than other methods.